Home How to How to copy text from a copy protected website? How to copy text from a copy protected website? Sometimes, we need to copy text from a copy protected website. But, some website owners protect their data from the copy. They also disable the right click option. When we right click on this protected page, it shows an error message or warning or it does not show anything. And we are not able to copy this content/article from this protected site. 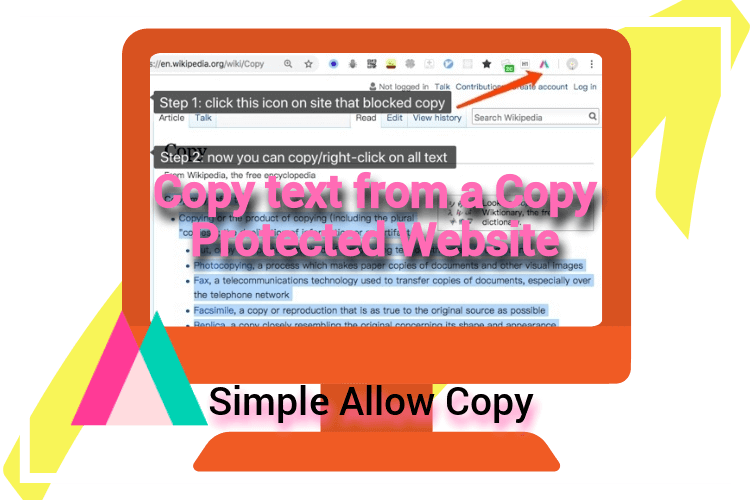 Now you will able to copy all the text for the protected website. No, external software is required to copy text from the protected website. There are a few ways to copy text from a copy protected websites. You can use online website copier tool. You can add Plugins/Extensions/Add-ons in your browser. I’ll show you through a Google Chrome Extension. The name of this extension is “Simple Allow Copy“. You can install this extension in your Google Chrome Browser. Click here to download and install the extension on your Google Chrome Browser. At the first visit at “Copy Protected Website” and try to copy something. I know, you will be unable to copy text from this website. Right click also disable in this website. So, the context menu does not show on right click. At first install the “Simple Allow Copy” extension in your Google browser. Now, open a copy protected site. Now, you will able to copy anything from any copy protected site.